Put an end to the constant maintenance problems and expenses caused by damaged mechanical seals or canned pump bearings. Now you can quickly and inexpensively eliminate costly repairs and equipment downtime with a Doxie Impurity Eliminator. The Doxie cyclone is a separator with no moving parts. There is nothing to adjust. In operation, the Doxie uses centrifugal force to spin abrasive particles from the liquid which flows on to the bearings or the dynamic seals on rotating shafts. Solids as small as a few microns in diameter are separated and removed. Only cleaned fluid reaches the rubbing surfaces. There are three Doxie cyclone models available. The Doxie 5 unit consists of six 10mm cyclones in parallel operation and is machined from a solid block of 316 stainless steel. The Doxie Type A unit is a single 10mm cyclone constructed in a similar manner. Both handle pressures up to 2000 psig at temperatures from ambient up to 400°F. The Doxie Type P unit is designed to operate efficiently with pressures up to 600 psig at ambient temperature and up to 200 psig at temperatures up to 2000°F. It is available in nylon or Kynar® construction. Differential pressure is critical for proper operation. The higher the differential pressure, the more efficient the separation action. 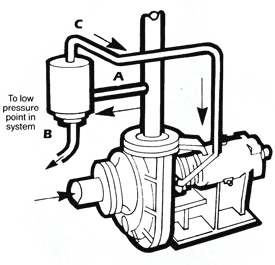 The differential pressure is the drop from the feed pressure to that of the overflow. Cyclone separators, such as the Doxie units, should not be used in applications where the pressure differential is less than 20 psi. Cyclone design plays a big part in developing high separation efficiency. The shape of the cyclone, the angle of its cone, the underflow opening size – all are important. The technological experience and leadership of Dorr-Oliver engineers in hydro-cyclonic separation assures you the finest design and the highest operating efficiency. Feed from the pump discharge is piped into the inlet which enters tangential to the cyclone cone. The liquid therefore rotates at a high velocity, very much like a whirlpool. Sand, dirt and other very fine particles are thrown to the wall of the Doxie cyclone and pass downward and out the underflow discharge. 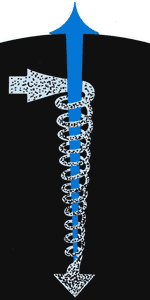 Cleaned liquid spins into the center of the cyclone and is forced upward and out the overflow discharge. This clean stream is then routed through tubing to the place of usage-the mating surfaces of the shaft seal or to the bearings. 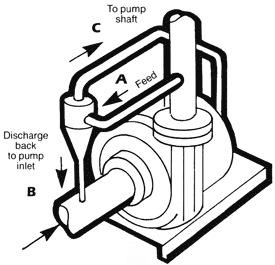 The pump provides all the pressure drop energy that is needed to provide the separation. Designate flow required. 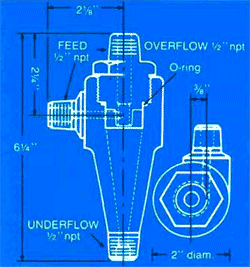 This may be the flow required for a mechanical seal. Since the Doxie cyclone splits the flow 60% clean to the overflow and 40% dirty to the underflow, divide the required flow (GPM) by .60 and this will give the feed flow required. The overflow flushes and cools the mechanical seal. Establish the size of particles to be removed. The Type A and 5 (10mm diameter) cyclones are used to remove particles in the range of 3-8 microns in diameter. The Type P cyclone (25mm diameter) is used to remove particles in the range of 10-15 microns. These size ranges are based on solids having a 2.7 specific gravity suspended in water. Contact us and we'll get a quote to you! Here, canned pump discharge is connected to feed inlet A on the side of the Doxie cyclone. 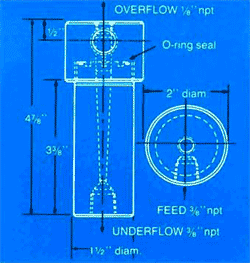 Liquid containing particles is ejected through underflow outlet B and is returned to the pump suction. Cleaned liquid from the vortex of the Doxie cyclone flows under pressure through overflow outlet C out to the bearings. 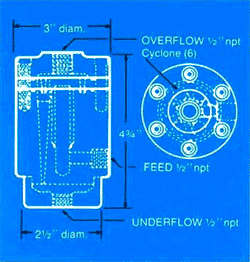 This is an example of a typical Doxie cyclone installation on a centrifugal pump to provide clean, abrasive-free injection flow for flushing the surfaces of a mechanical shaft seal. A is the feed inlet to the cyclone, B is particle-bearing underflow return, and C is clean overflow routed to the seal. 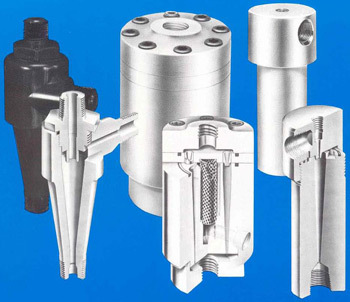 Six 10mm cyclones manifolded in a patented common pressurized housing. Clog-proof design, adjustable capacity and self contained strainer. Available in 316 SS, maximum working pressure 2000 psi up to a maximum operating temperature of 400°F.